Fred Meyer is a part of the Kroger which also has ads in the Weekly Ads site. Browse the Fred Meyer Ad which generally offers similar products of grocery from other stores in different states like Fry’s, Kroger, and Ralphs. BOGO Free deals, digital coupon savings, mix and match sales are possibly profitable discounts from the weekly sales. They also offer occasional sales at Christmas, Easter, St. Patrick’s Day etc. 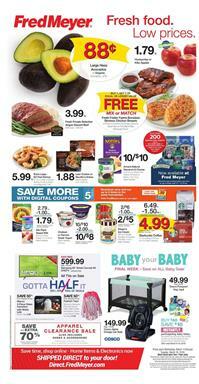 Lenten food advice, special discounts are frequently the content of the Fred Meyer Weekly Ad. Contact Fred Meyer on phone number; (1-800-576-4377). Send email for questions or call them. The retailer has also pharmacy, health-care, personal care products and services. You can get your prescriptions there. Floral sales with bouquets of roses or other flowers are also available content in these weekly ads. Stock up snacks, enjoy the last minutes of these savings and browse the Fred Meyer Ad Digital Coupons on the first part. Digital coupons are discounts that are valid for products like Starbucks coffee, Dreyer's ice cream, Chobani yogurt, and Silk plant-based milk that are available on pg 1. You can find your favorite chemicals and personal care products from the household part of the pg 2. Arm & Hammer liquid laundry detergent, Downy fabric softener, Tide, Palmolive, and more are featured products of that part of the Fred Meyer Weekly Ad. Profitable purchases are waiting for you on the same page. 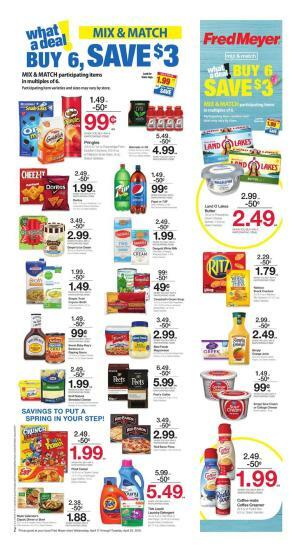 Gatorade or G2, Kraft Natural shredded cheese, and more items are multiple-buy discounts. Buy 10 Birds Eye frozen vegetables for $10. Tropicana or Trop50 will cost $6 for 2 and more multiple buys are available there. Save with OptUp at Fred Meyer. The last part of the latest ad was about fresh produce. I am waiting for a new one tomorrow or on Wednesday. There should be prints or scans on the internet or in-store. Follow our Facebook page or subscribe to get the newsletter in your inbox.